The process consists in capturing the water contained in the clouds in order to use it as a source of water for household (drinking water) and agricultural purposes. This process, which has been around since antiquity, was rediscovered and started to be implemented at the end of the last century avec a first experimental project in El Tofo in Chile. This technique has expanded to regions of other countries such as Nepal, Oman and South Africa. Certain arid regions that do not benefit from resources in water are bathed in thick fog during a major part of the year. This fog has a moisture content close to 100%. Research centres have therefore perfected technologies that make it possible to recover the condensed water in sufficient quantities to supply remote villages with water. The populations that are most concerned with this method are those living in certain arid areas, at a sufficient altitude and in a site that is conducive to the formation of coastal or mountain fog for long period of time. Indeed, special meteorological and geographical conditions must be present in order for the method to be able to recover enough water. This technique can therefore be considered only in very special regions where thick fog forms frequently. The condensation of the water from fog can then be recovered and used as a source of water in order to supply small villages in zones where the amount of rainfall is low or does not exist. Once the geographical and climate conditions are favourable, the process is not difficult to implement. The water contained in fog is collected thanks to collectors made from polypropylene nets. Each net is stretched out, between two vertical posts, at about 2 m from the ground, where the wettest fog is formed. These nets must be mounted perpendicular to the prevailing wind. When the fog passes, small droplets of water form on the mesh of the net. The latter then fall into gutters which supply a reservoir. The water is then carried via gravity-fed flow or by pumping to fountains or to the faucets of the villagers. On the average, the quantity of water produced is 3 to 15 l/day/m2/day, but up to 50 in the best conditions. It is also possible to implement the process without having to set up nets, but by recovering the water coming from the condensation of the fog on small leaves on certain trees which naturally play the same role as a net or grid. 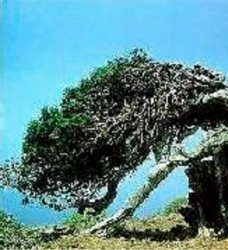 These trees are often called "fountain trees" (Examples are the garoe (rain tree), a variety of the sweet bay, or the oloivillo or the canelo in Chile. If the leaves are thin and the network is dense, the leaves play the same role as the net. It is then sufficient to recover the condensed water in a reservoir at the foot of the tree. A brochure from ISIM and OIE "The search for blue gold" mentions the case of mountain villages in Chile where the water in the past had to be carried in tankers, which were moreover used for other purposes due to economic reasons and was sometimes contaminated. Installing fog collectors stretched between wooden posts made it possible to supply 25 to 50 l of clean water per person per day, which made it possible to also cultivate vegetables. The average cost for operating the system has shown to be about 6 times less than that of a traditional water distribution system (between €1 and €2 according to the distance from the collectors to the village). But the purchase price for the nets, which was not specified, was rather high when they could not be manufactured on site. Prior to implementing the process, it must be made sure that the required climatic conditions do indeed exist. 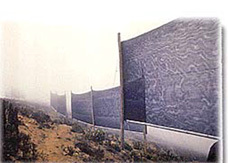 In addition, as fog concentrates pollution, this technique must be reserved for zones that are far from potential sources of pollution. 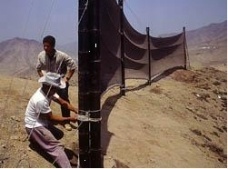 Although the nets are designed to be installed in windy areas, the latter can be torn in the event of violent winds. It is therefore important that the materials needed to repair them are available and that people in the population are trained to make these repairs. The quantity of water produced can be enough to provide drinking water to a village of several hundred inhabitants in areas where the resource is insufficient and where the supply of water can be provided via tankers only at a very high cost. The system is easy to install and maintain. The operating cost is practically zero, as no energy or treatment is required. - The system can operate only in very specific conditions. The production of water is therefore not ensured in the same way throughout the entire year. - The purchase price for the nets is relatively high. In addition, they are usually not manufactured locally. - Inserting them into the landscape is usually not very aesthetic. There is very little information concerning the production cost which would include the purchase of the nets, the collectors, the reservoir and the pipes as well as the labour for assembly. This can vary greatly from one country to another. For example, in Peru, the total cost including assembly was about 500 Euros for a 48 m2 net. The cost of maintenance is very low as the method does not consume any energy and the time required for maintenance is minimal. The lifespan of a polypropylene net is about 10 years. Once the site and the orientation of the nets have been chosen, the installation does not give rise to any major problems. However, experience has shown that the system can function correctly over the long term only if the project is genuinely accepted by the population, if the latter have been sufficiently informed and if it is involved in setting up and in maintaining the equipment. In this community, 30 large nets were installed, allowing for an average production of 6,000 litres a day which can supply 140 people with drinking water. When the project was initiated, the village was chosen not only for its geographical location, but also because of the capacities and the motivation of the inhabitants to build it and to run it. So, after several informational meetings bringing together in particular the women of the village, the construction was able to take place with the active participation of the population. For the creation of the system and its maintenance, a management committee was created in such a way that the maintenance is handled by the inhabitants themselves. A network of specialists scattered throughout the village was as such formed. After receiving training, the latter are able to intervene according to their availability. Moreover, a stock of tools was formed in order to ensure the availability of all of the tools needed to make repairs. Everything is still operating well. After about ten years of overall satisfactory operation on the El Tofo site in Chile, which also had been a pioneer in this matter, the nets have fallen into disuse and have been abandoned. The main reason for the lack of maintenance is due to the fact that the population was not sufficiently involved in the project’s success and in the end, the local officials asked that the community be supplied with water via a pipeline. In conclusion, it is very important to obtain the collaboration and the approval of the population in order to for the project to be a success. As with any innovative technology, it must be applied in a social context which must be given one’s complete attention.